Microsoft has seen its quarterly profits almost double, boosted by strong demand for its server software and Xbox computer games console. The world's biggest software company reported third-quarter net profits of $2.56bn (£1.3bn), up from $1.32bn at the same time last year. 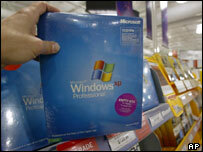 However, Microsoft's sales during the three months to March did not fully match market expectations. Revenue rose to $9.6bn - below analysts' forecasts for $9.8bn. "Given our optimism about the future with our strong product pipeline and the growth opportunities from our investments in innovative products and services, we expect increased revenue growth in fiscal 2006," said Scott Di Valerio, Microsoft's corporate vice-president and controller. Microsoft forecast fourth-quarter revenue of between $10.1bn and $10.2bn, against Wall Street's target of $10.1bn. The company's robust profits followed a warning from a European Union (EU) spokesman on Wednesday that Microsoft could incur additional fines unless it did more to stop abusing its dominant market position. In March 2004, the EU found Microsoft guilty of preventing competition and fined the company 497m euros ($640m; £343m), ordering it to open up its core software systems to rivals. The EU spokesman's comments came after a meeting between EU competition commissioner Neelie Kroes and Microsoft boss Steve Ballmer.